One of the things you have to think about when moving to a smaller space is the kitchen. How much cooking will you be doing? I only cook for myself, but I do like to eat as healthy as possible, which means no processed or fast foods. That also means I will have to start thinking about which kitchen gadgets I actually use and how will I store them in my small kitchen. 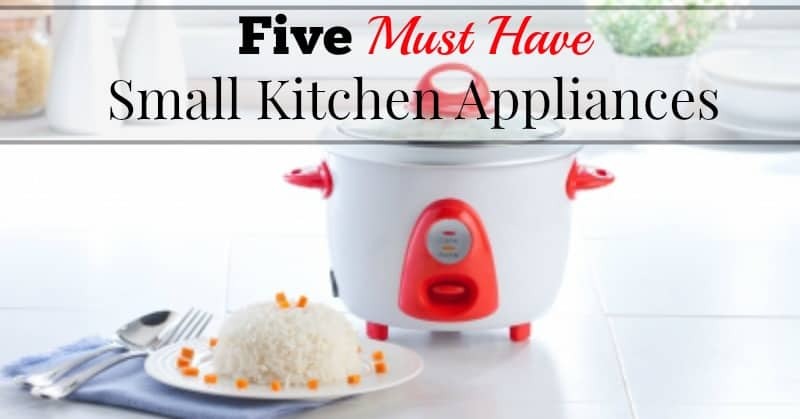 I came across this blog post about five must have small kitchen appliances at Our Small Hours. My needs aren't exactly the same as hers, but I definitely need a small slow cooker. I gave the extra large slow cooker to my daughter. She has three children and a very hectic schedule, so I thought it would be a great way for her to put some soup on in the morning and have it ready when dinnertime rolls around. I hate cooking at night (I am definitely a morning person) so I will be adding it to my list. My good friend Brenda at Cozy Little House recently moved into a smaller space and redid her kitchen. It is wonderful and if for some obscure reason you haven't seen it, you can do so here. How adorable is this space. 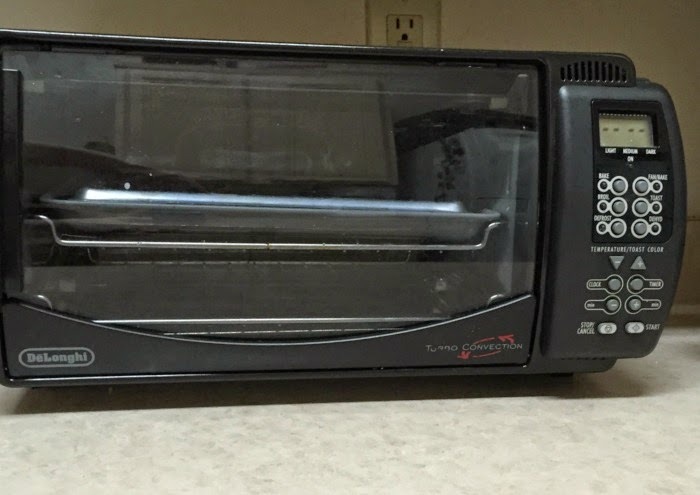 She completely got rid of her oven, which I will not be able to do, but my mom gave me her small combination toaster/convection oven and if she doesn't do her usual, "hmmmm, I think I want that back", then I will be taking it with me. It is something that I use a lot. I have sold several of these old rake heads. 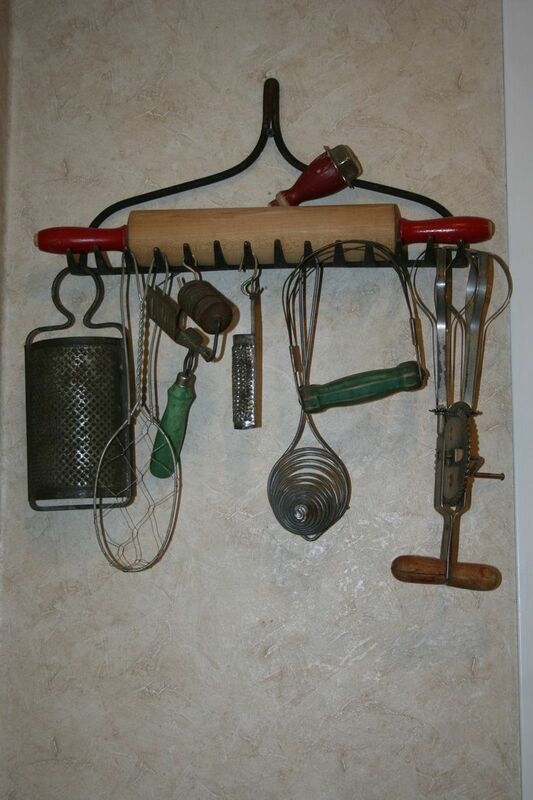 They are great for displaying your kitchen gadgets or wine glasses. I noticed that Brenda has one in her kitchen. I think the next time I come across one I will keep it for myself. If I move into the apartment I looked at in Atlanta I don't think there is a wall space for hanging things, but I came across this idea, which is something I might be able to do. They have inserted a wood piece between the refrigerator and the counter. Love this. Just a few ideas this morning. I'm sure I will be posting a lot more small kitchen ideas in the weeks to come. I have changed the name of my series To New Life...Smaller Spaces, because when we downsize to a smaller space we are creating a new life for ourselves. Hopefully, a more simple and serene life. P.S. 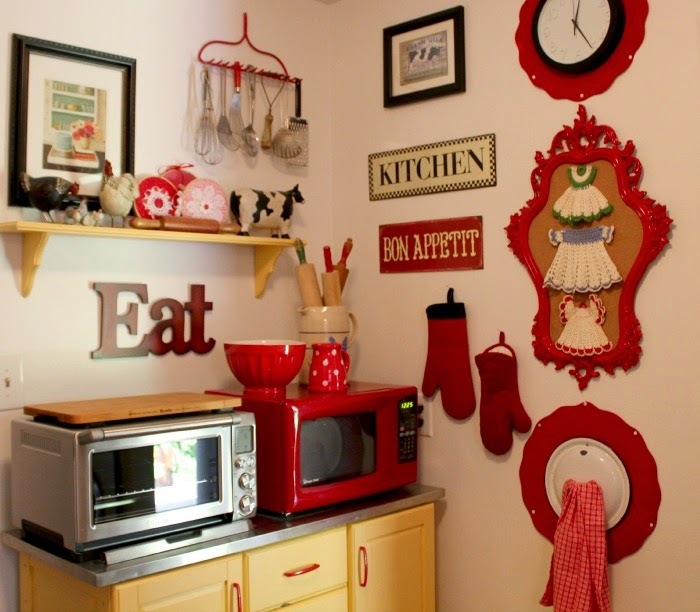 For more great kitchen ideas check out my Kozy Kitchens board on Pinterest here. Good ideas all! Brenda's kitchen is adorable! 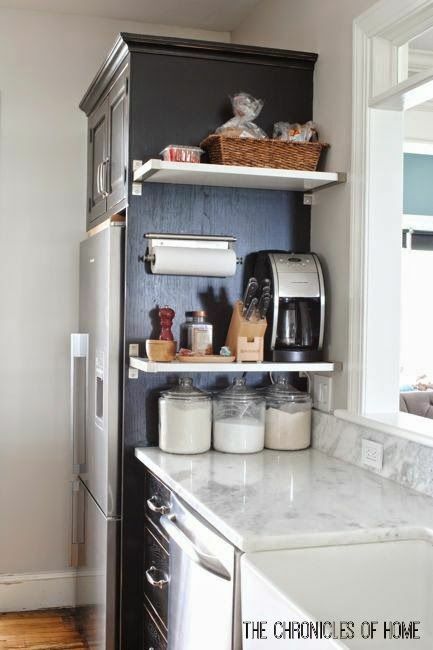 Love that over the fridge shelf idea! And the hanging rake...lol where do people come up with this stuff / theyare so creative. I kept my oven, because I use it a lot, but I don't have a microwave. I also don't have many gadget that are supposed to help you. I cook on the stove or in the oven and that's it. I think you'll find what you can get rid of and what you must keep by paying attention to how you cook. My choices aren't for everybody, I know! We have a cabinet in the garage that keeps all the kitchen gadgets, large serving bowls, etc that we don't have room for in the kitchen. If it isn't used weekly, it gets stored in there. :) (large items too, even if they do get used frequently, like extra skillets, crock pot, electric skillet, cookie sheets, etc.